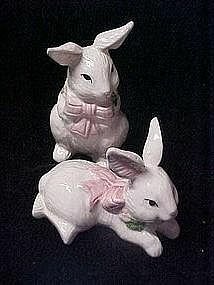 Pretty white rabbit figurines hand painted with flowers and big pink bows. Tallest bunny measures 3 1/2" tall, and the other measures 3 1/4" long. Perfect condition. Would be a cute accessory for Easter decoration.